I love the colours in this dish. Either keep it simple and pair it with a piece of grilled fish or tofu. Or create a mezze plate and serve it alongside my Saffron Couscous Salad and a bowl of warm olives. As this dish contains minimal carbohydrates it can basically be included in this list of ‘free’ gestational diabetes foods. Preheat oven to 190°C/ 170°C fan-forced/ 375ºF. Even coat cauliflower with paprika by putting both in a clean plastic bag and shaking well. Remove cauliflower and spread evenly over a baking tray. Spray lightly with olive oil and bake for around 25 minutes turning once. 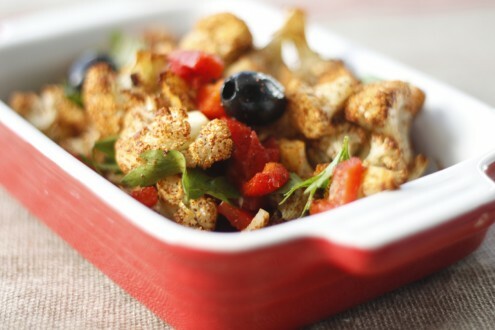 In a large bowl add cauliflower, preserved lemon, black olives, roast capsicum, lemon juice, parsley and olive oil. Toss well and serve. Halve and hull the capsicum. Lay both halves flat on a baking tray like butterfly wings, skin side up. Place under a grill on high until the skin is blackened all over. Carefully remove capsicum and put in either a sealed plastic bag or container for 5 minutes. This makes the capsicum sweat and allows for easy peeling. Peel and slice into strips. Post GDM suggestion: Add 150g low fat fetta. I’m such a big salad eater but get stuck in a salad rut and end up using the same ingrediants all the time. This looks great but is it filling? What else would you have with it? I think I’d need an extra little something but can’t think of what I’d put with it. I definitely think you should add the fetta then & if you don’t have GDM, you could add some crispy pancetta & roast sweet potato. Let me know how that goes. Very interested to try this. I’m a roast veg fanatic but never thought to use cauliflower! Would you have a suggestion for what vego option to use instead of the olives? Not a fan of them and feel it may be lacking if I just left them out. Would the fetta do the trick? Good question! I haven’t tried this myself but you could try replacing olives with caper berries (a juicier and milder cousin to the caper.) Let me know how that goes.